Those of us watching the discussion chuckled at his comment, acknowledging the honesty and literalness you usually find in autistic individuals. Unfortunately, one of the panelists made the mistake of calling Gray “Greg” about halfway through the program. “I told you not to call me that,” Gray blurted out. That was it. Issue resolved. Everyone said how they felt, and they moved on. There’s something refreshing about honesty. Everyone knows how they stand. The issues are out in the open. Recently, I’ve been watching an issue involving some misunderstandings. Everyone is dancing around the subject, instead of addressing things head on. It’s a mess. We are told in God’s Word, “speaking the truth in love, we are to grow up in all aspects into Him who is the head, even Christ” (Ephesians 4:15, NASB). We are also instructed, “Let your ‘Yes’ be ‘Yes,’ and your ‘No,’ ‘No’ For whatever is more than these is from the evil one.” (Matthew 5:37, NKJV). Honesty goes a long way toward clearing up issues. The truth comes out on the table for everyone to see, deal with, and hopefully resolve. 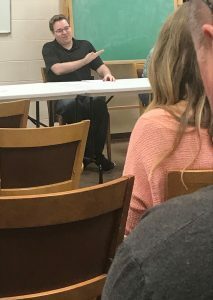 “People seem to like my honesty and literalness,” Patrick said during the panel discussion. He has always been quick to try to resolve issues, and once they’re resolved, he moves on. Gray did the same. Once he communicated how he felt and everyone acknowledged it, he forgot about it. The Lord calls us to work out issues in honest, honoring ways . . . whether we are upset, or someone is upset with us. He says, “‘If your brother sins against you, go and tell him his fault between you and him alone. If he hears you, you have gained your brother’” (Matthew 16:15, NKJV). He also says, “‘If you are presenting your offering at the altar, and there remember that your brother has something against you, leave your offering there before the altar and go; first be reconciled to your brother, and then come and present your offering’” (Matthew 5:23-34, NASB). Sometimes, the best way we can honor the Lord is to show love and respect to others. I saw a great deal of honesty and sincerity among the autistic panelists. There was no pretense, no attempt to impress. They were simply themselves, and it was beautiful. Lewis, a young man on the panel, broke out into spontaneous applause several times when he thought a panelist mentioned something significant. By the end of the event, he was getting the audience members to do the same. Hebrews 3:13, NASB, says, “Encourage one another day after day, as long as it is still called ‘Today.’” Encouragement certainly flowed freely among the panelists that evening. Rachel, a spirited young woman on the panel, floated around the room after the discussion and told each panelist what a great job they did. She asked for their emails so she could invite them to IGNITE, a social group for young adults with autism. These young people understood and accepted one another. They championed one another’s success. There was no competition, no spitefulness, just a genuine respect and desire to see the others succeed. Jesus said, “‘A new commandment I give to you, that you love one another; as I have loved you, that you also love one another. By this all will know that you are My disciples, if you have love for one another’” (John 13:34-35, NKJV). The word love in this verse is agapao. It means unconditional, unrelenting love; a determined goodwill that seeks another’s best interests. I saw that kind of love in the panelists toward one another. Love and respect with no strings attached. They gave freely to one another and expected nothing in return. Prior to that Tuesday evening, the panelists had not met one another. Yet, they welcomed one another with grace and kindness. One panelists flapped his fingers. Another paused and got stuck in communicating her thoughts. It didn’t matter. Each member of the panel was greeted warmly and accepted by the others. In a society that often builds fences and categorizes people into groups, the young adults on this panel communicated worth and a warm welcome to one another. They did the same with the adults who attended the meeting and wanted to talk with them afterwards. They reminded me of how Jesus would welcome anyone who came to Him . . . people like the woman at the well (John 4), the Pharisee Nicodemus (John 3), and the tax collector Zaccheus (Luke 19). In fact, He says, “‘Come to Me, all who are weary and heavy-laden, and I will give you rest. Take My yoke upon you and learn from Me, for I am gentle and humble in heart, and you will find rest for your souls’” (Matthew 11:28-29, NASB). I experienced a great deal of gentleness and humility in the autism panelists. They nodded gently when panelists shared their challenges, and they laughed deeply when they confided amusing stories. They smiled when panelists offered advice or talked about personal accomplishments. They were available to welcome and help others. I could tell they did not view the evening as something about them . . . they were focusing more on being available to the other people there. I suppose the panel discussion impacted me so much because I saw the traits of Jesus in those young men and that young woman: honesty, kindness, and a welcoming heart. I’m asking the Lord to develop more of those qualities in me. 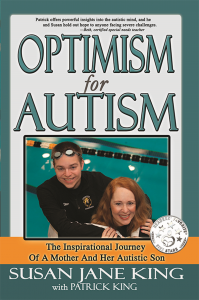 I saw how greatly He can use those qualities through a profound gathering of young autistic adults. Question: What has the Lord taught you about Himself through observing others? Comment at the link below.